Details and times were correct at time of publishing but may be subject to change. We have a ‘no refunds’ policy (see Booking terms and conditions / Refund Policy below). 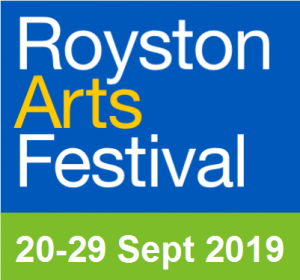 The Creative Royston Management Committee (CRMC) accepts no liabilty for any loss, damage or injury sustained by any member of the public visiting any venue participating in festival events or activities, this includes any loss damage or injury resulting from an act of terrorism. It is the artists’ own responsibility to have public liability cover. We may take photographs for publicity purposes. All people attending festival events will be deemed to have consented to having their photograph taken and their image used in this way. Visiting adults are responsible for the supervision of any children in their care. Admission: The Creative Royston Management Committee (CRMC) reserves the right to refuse admission. Alterations: CRMC reserves the right to cancel or alter workshops, exhibitions and events. Programming alterations are at CRMC’s discretion. Ticket refunds: We regret ticket money cannot be refunded unless a performance is cancelled. Then only the face value of the ticket will be refunded. The resale of tickets: Tickets will only be offered for re-sale once a performance has sold out. Booking fees for exchanges paid for by credit card will not be refunded. All exchanges and refunds are at CRMC’s discretion. Latecomers: Performances start promptly at the advertised time. Latecomers may be asked to wait until a suitable pause in the programme before being shown to their seats. 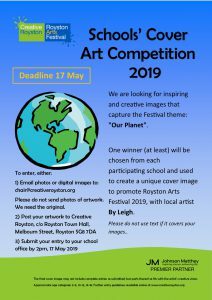 The term ‘Creative Royston’,‘Royston Arts Festival’ or ‘us’ or ‘we’ refers to the owner of the website, Creative Royston Management Committee. The term ‘you’ refers to the user or viewer of our website. · You may not create a link to this website from another website or document without CRMC’s prior written consent. Creative Royston is committed to ensuring that your privacy is protected. Should we ask you to provide certain information by which you can be identified when using this website, then you can be assured that it will only be used in accordance with this privacy statement. Creative Royston may change this policy from time to time by updating this page. You should check this page from time to time to ensure that you are happy with any changes. This policy is effective from 2 December 2009. 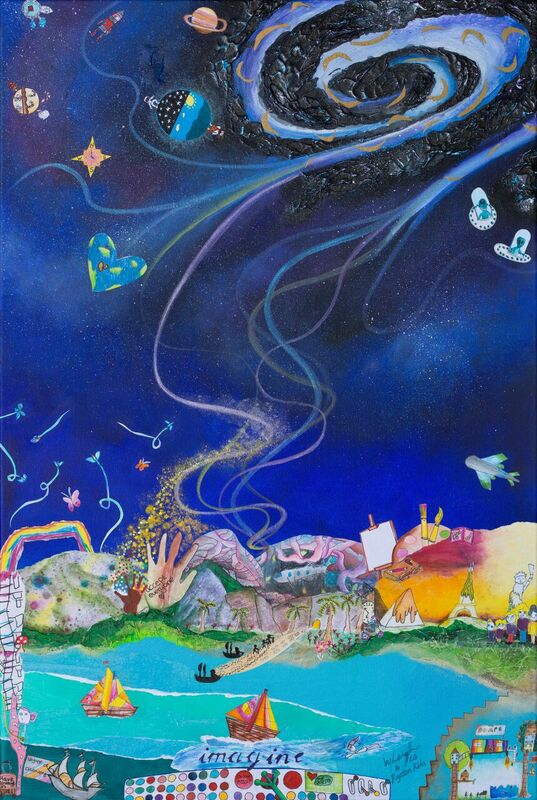 · We may use the information to improve the festival. 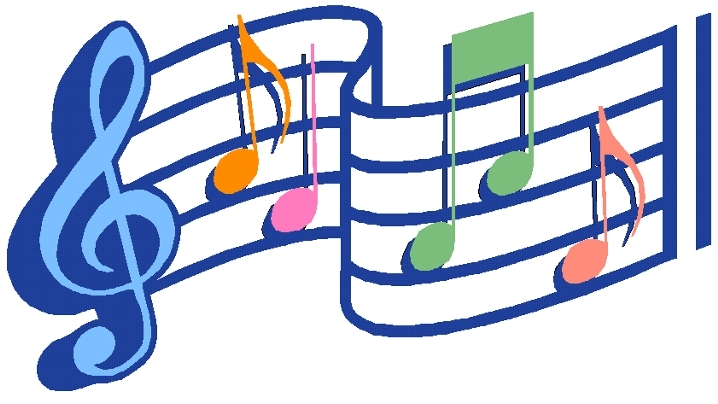 · We may periodically send promotional email about the festival or other information which we think you may find interesting using the email address which you have provided. · if you have previously agreed to us using your personal information for direct marketing purposes, you may change your mind at any time by writing to us or emailing marketing@creativeroyston.org. You may request details of personal information which we hold about you under the Data Protection Act 1998. A small fee will be payable. 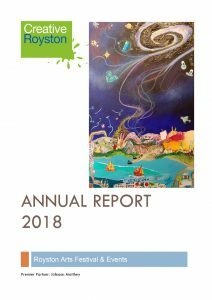 If you would like a copy of the information held on you please write to The Data Protection Officer, Creative Royston, c/o The Town Hall, Melbourn Street, Royston, Hertfordshire SG8 7DA. Please also refer to our Data Protection Statement which can be found under ‘About Us’ and ‘Key Documents’ on the dropdown top menu on this website. The information contained in this website is for general information purposes only. The information is provided by Creative Royston and while we endeavour to keep the information up to date and correct, we make no representations or warranties of any kind, express or implied, about the completeness, accuracy, reliability, suitability or availability with respect to the website or the information, products, services, or related graphics contained on the website for any purpose. Any reliance you place on such information is therefore strictly at your own risk. 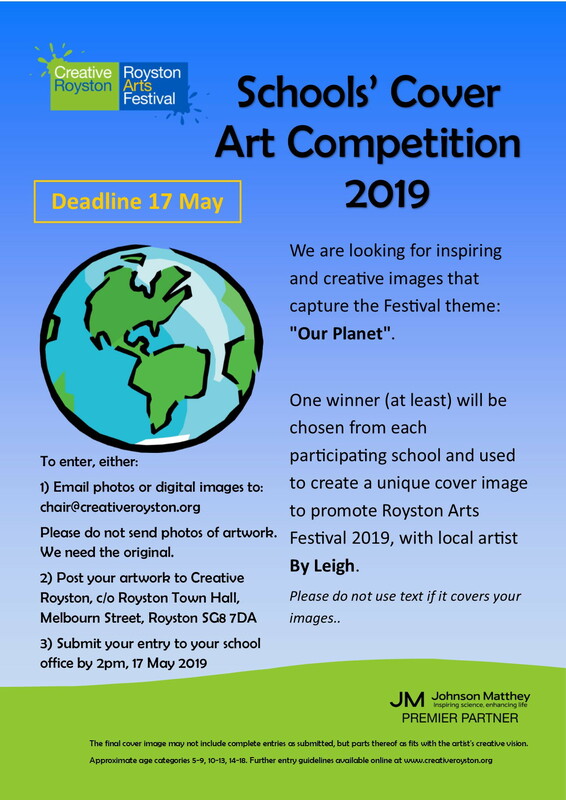 Through this website you are able to link to other websites which are not under the control of Creative Royston. We have no control over the nature, content and availability of those sites. The inclusion of any links does not necessarily imply a recommendation or endorse the views expressed within them. Every effort is made to keep the website up and running smoothly. 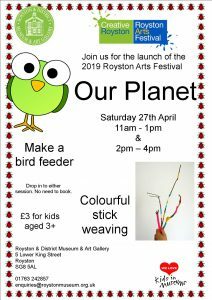 However, Creative Royston takes no responsibility for, and will not be liable for, the website being temporarily unavailable due to technical issues beyond our control. This website and its content is copyright of Creative Royston – © Creative Royston. All rights reserved.